USAID is located in the Ronald Reagan Building, 1300 Pennsylvania Avenue, NW, Washington, D.C. 20523. BCPI is an official printing contractor for USAID. 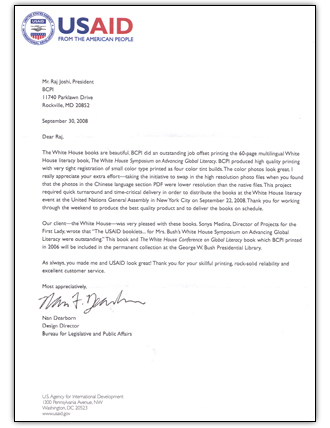 Please click the testimonial letter below to read about our service to the USA ID and White House literacy campaign.